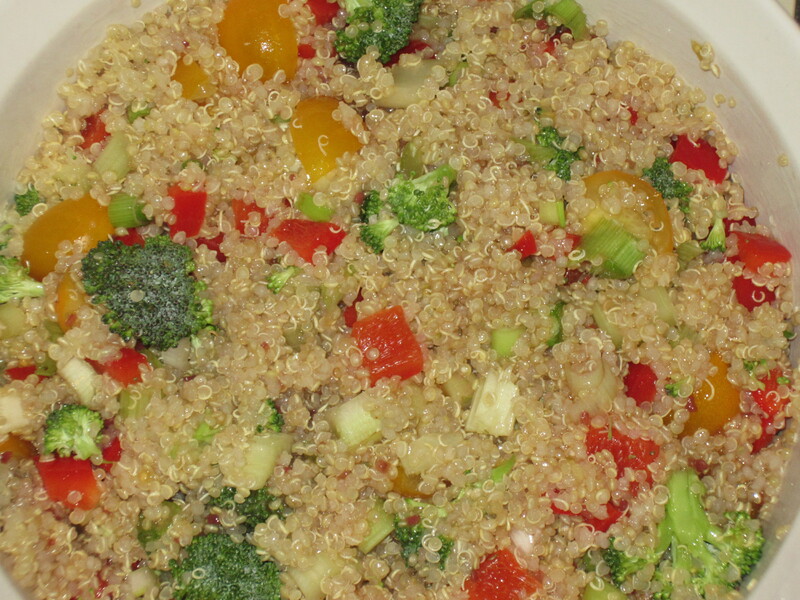 Quinoa salad can be found in my refrigerator about 50% of the time. Quinoa is full of protein and a great substitute for pasta or rice and great if you are trying to avoid gluten. The combinations with quinoa are endless. I select vegetables that are in season toss with Gazebo Room Greek salad dressing (or your favorite vinaigrette) and you have a wonderful salad. This salad has become a favorite at our book club, potluck gatherings made by different people with their own wonderful variations. What variations have you tried? Bring water to boil. Add quinoa, cover and return to boil. Lower heat, cover and cook for 15 minutes. Remove from heat and let sit, covered, for another 5 minutes. Fluff with a fork and let cool. Chop your favorite vegetables (broccoli, tomatoes, celery, carrots, corn, onions, peppers, etc.). I also add a can of drained garbanzo beans. Dress with your favorite vinaigrette (I used Gazebo Room Greek Salad Dressing). This great dressing was introduced to me by friend, Chris (aka Grandson Evan’s other grandma). Since Gazebo Room is not available (yet?) in Colorado, we order from their website. Still working on King Soopers to carry this great product! Chill and serve. The salad keeps well in the refrigerator for several days. Vegetable Pizza served cold and is a great appetizer and a family favorite. This recipe made its way to my wooden recipe box many moons ago and has been a favorite of our family for many years. The recipe is simple and easy to make. Two tubes of Pillsbury Crescent Rolls, sour cream, garlic powder, dill, fresh veggies and cheese and you’re prepared. It’s refreshing in the summer and a side dish to serve with a hearty soup. Make an hour or two before serving and chill in the refrigerator. Spread crescent rolls flat and bake in 9×13″ pan until slightly brown. Cool. Mix together sour cream, dill weed and garlic powder. Spread on cooled crust. Top with chopped fresh vegetables. Sprinkle top with shredded cheese. Cut into small squares for serving. Can half the recipe and bake on round pizza pan.